The proximity to the water is a great attraction to life here in Pensacola. But that closeness can also cause flood damage problems after a storm. Should your home face flooding after a storm, contact our IICRC certified team for effective water removal services. 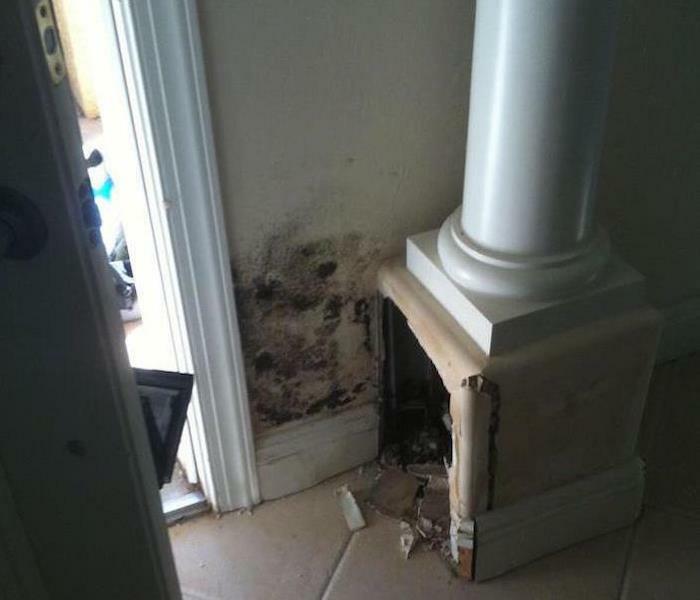 Florida residents are used to storms and flooding, but most people don't expect to have water damage inside their homes. The SERVPRO Franchise System is ready to handle emergencies such as this. We have the equipment and training to make it "Like it never even happened." SERVPRO of West Pensacola is ready to handle your water loss emergency. 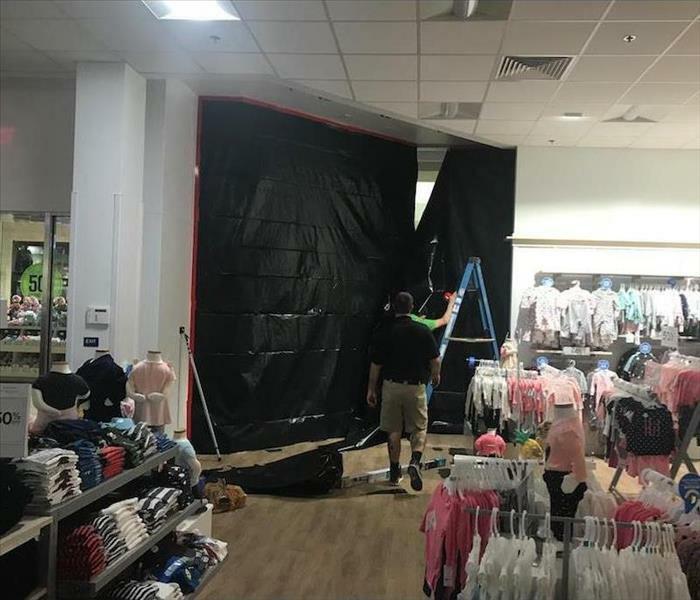 Finding mold in a children's clothing store at the local mall can be quite disconcerting. Remediation needs to happen quickly so that the store can stay opened for customers. That is where SERVPRO comes in. Should your home or business location have a mold infestation, call our IICRC certified SERVPRO team to remediate the damage and keep the doors to your business open for customers. Team SERVPRO of West Pensacola gets many calls in Ferry Pass and surrounding areas for remediation including those for mold damage. Our IICRC certified and experienced team is ready to assess any job, large or small. We arrive ready to stop the spread of the mold infestation in your home. Call us right away for best results, (850) 469-1160. We make it "Like it never even happened." Saving documents must occur during a specific time frame after water damage hits. SERVPRO of West Pensacola's expert technicians arrived quickly on the scene and prevented valuable information from sustaining further damage. 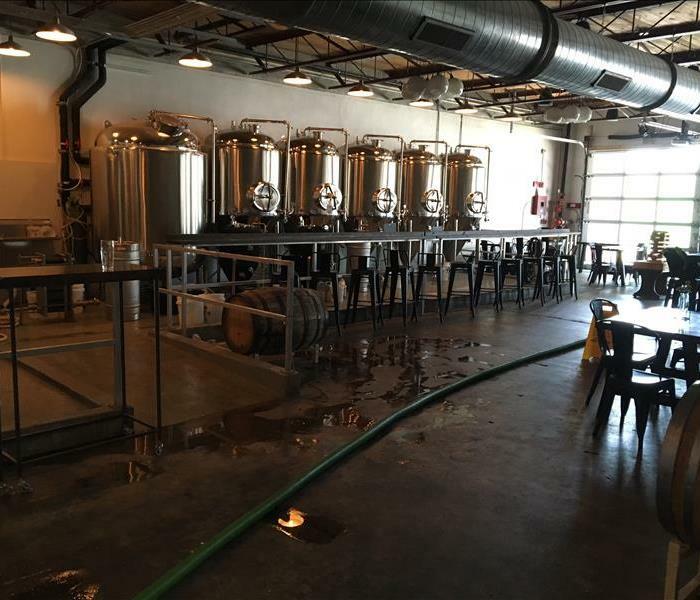 When unexpected water damage occurred in this brewery, the owners called SERVPRO. We quickly responded and with our state-of-the-art equipment and expertise, removed the water from the facility. The owners were pleased with the results. Call SERVPRO for all of your water damage needs. Yes, the storms of life occur when we least expect them. And that includes Gulf Storms and the water damage that they bring. 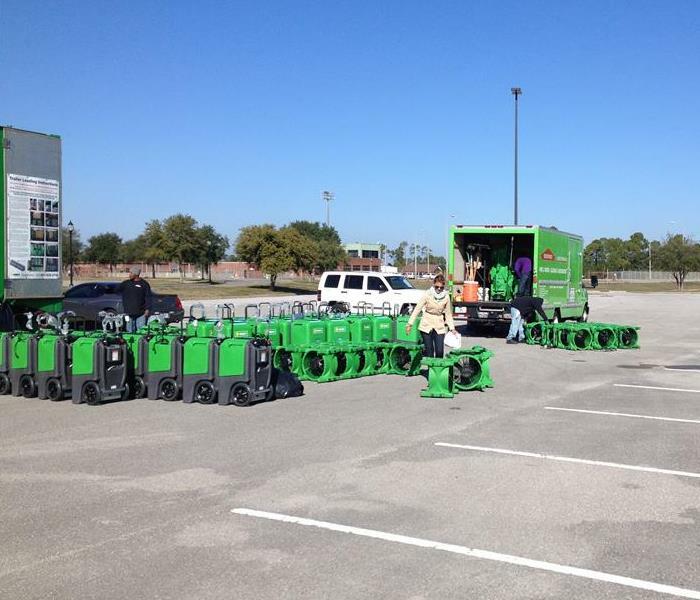 SERVPRO of West Pensacola is prepared to handle these storms and is equipped with state-of-the-art dryers and air movers to restore your home as quickly as possible. Call SERVPRO of West Pensacola at (850) 469-1160 24/7 to put our team to work. The crew at SERVPRO of West Pensacola is your best choice when it comes to storm damage repair and restoration. Our storm damage specialists are ready to respond to your emergency 24/7. We have the equipment, training, and experience to restore your home to pre-damage condition. We’re Faster to Any Size Disaster! One of the factors that contribute to SERVPRO of West Pensacola being the industry leader in water damage cleanup and restoration is the deployment of cutting-edge technology. 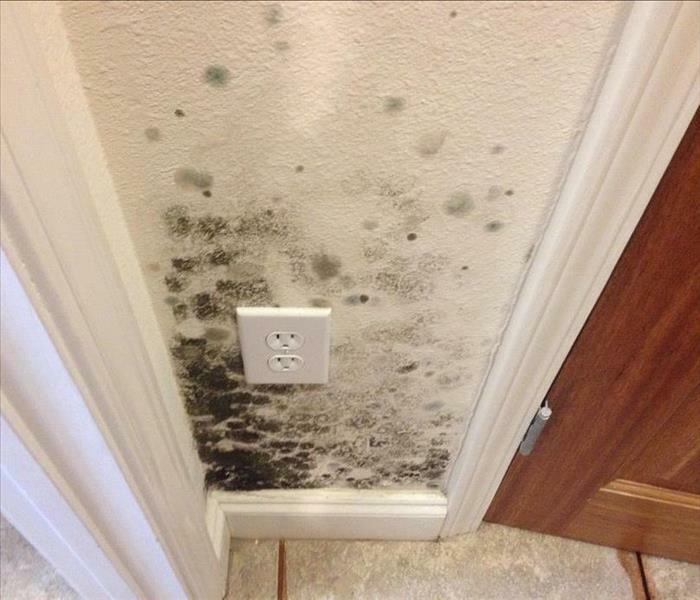 This home in West Pensacola was quickly dried by our skilled technicians, but a lingering odor remained. Pictured is the Titan 4000 Photocatalytic Hydroxy Generator, the destroyer of malodorous airborne compounds. This device improves IAQ indoor air quality by a complex chemical reaction of creating ions that combine with the unwanted molecules and reducing them to water and carbon dioxide. This neutralizing equipment is stocked in our Green Fleet, allowing our customers to smell the fresh, clean air once again and feel "Like it never even happened." Our staff is highly trained in property damage restoration. From initial and ongoing training to regular IICRC industry certifications, our staff has with the knowledge and experience to restore your Pensacola area property. The Institute of Inspection Cleaning and Restoration Certification (IICRC) certifies and sets the standards for the cleaning and restoration industries. Our local team of professionals study IICRC standards and best practices in water damage, fire restoration, mold remediation, carpet and upholstery cleaning, and other cleaning courses. Pictured is Steve Stone and production manager Mason Bradley. Electrical Fire in Milton, FL. This was the scene of an electrical fire in Milton Florida. The customer used SERVPRO of West Pensacola several years ago for a small water loss and remembered that we had done a good job. He didn't hesitate to call us this time either. We responded and began communicating with his insurance adjuster immediately on what would and would not be covered. We began demo and cleanup the next day. Commercial Water Loss in Ferry Pass, FL. 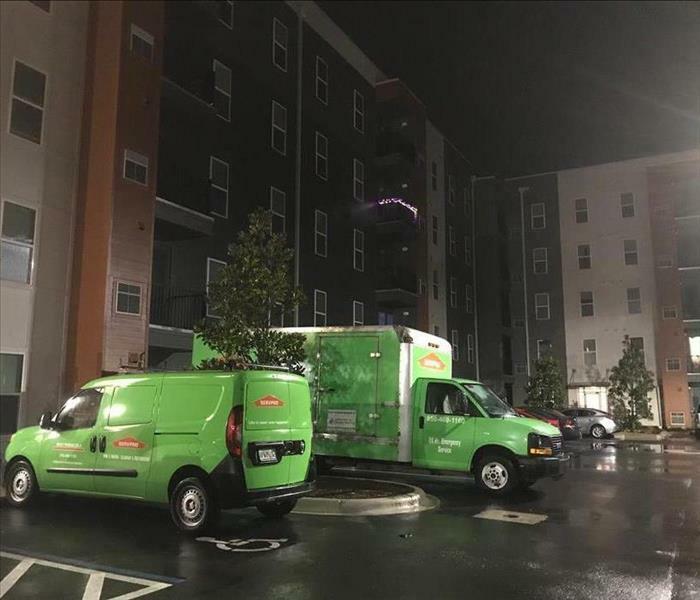 SERVPRO of WEST Pensacola got the call early in the morning on a Sunday that an apartment complex had a fire sprinkler discharge on the 5th floor. We arrived within an hour and began extracting water immediately, once the water was extracted and the contents moved we were able to place equipment and begin the drying process. It was a full eight hours before the situation was stable and the structure was drying. Call SERVPRO of WEST Pensacola for all your emergency water needs at 850-469-1160. SERVPRO of West Pensacola is ready day or night if your home experiences a fire damage emergency. Our technicians have a fast response time which limits further damage and reduces your restoration costs. We have a crew of highly trained experts and cutting-edge equipment to restore your property to pre-damage condition. We’re Faster to Any Size Disaster! 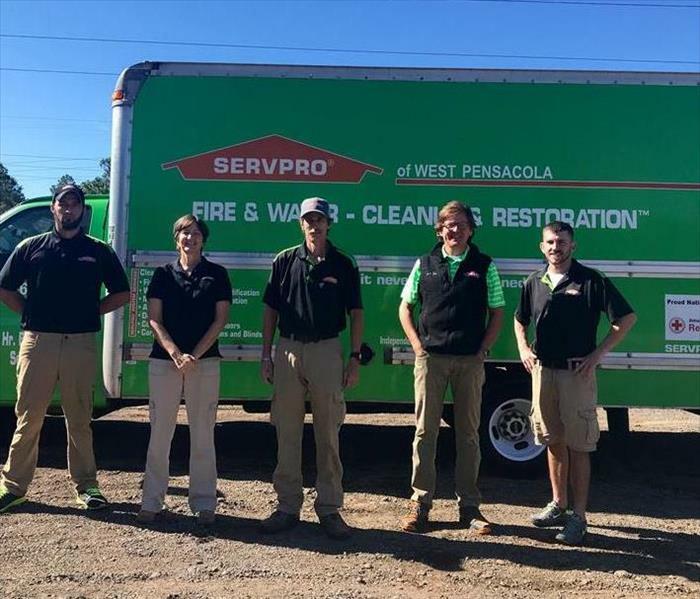 SERVPRO of WEST Pensacola has a full staff ready to handle any size loss. All of our employees are back ground checked, knowledgeable and courteous and we are willing to go the extra mile to insure that all our customers are satisfied and happy with our service. SERVPRO of WEST Pensacola is ready to assist you 24/7, 365 days a year, Call us at 850-469-1160. Mold Growth in Sailboat in Pensacola, FL. The Owner of this sailboat called SERVPRO of West Pensacola to remediate mold growing inside the cabin. The boat was in dry dock for minor repairs during an extended time of very rainy weather. 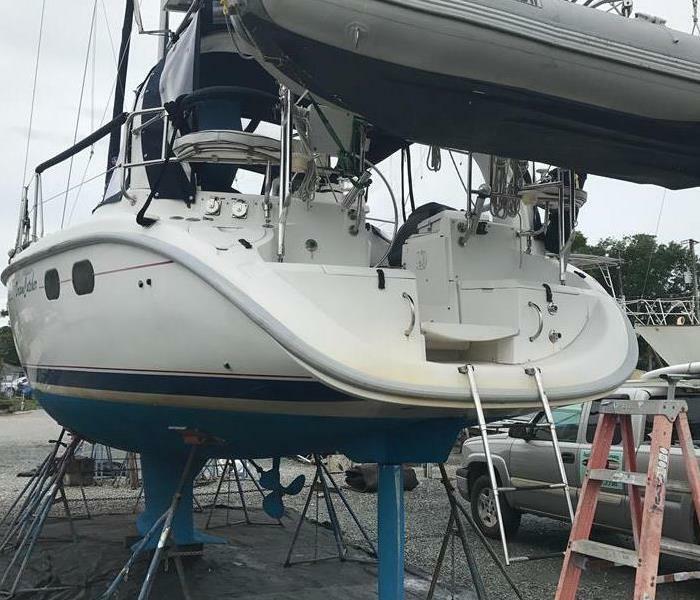 The boat suffered a leak that went undetected until it was too late and mold had covered the inside. SERVPRO of West Pensacola was called and were able to successfully remediate all the microbial growth. Call us at 850-469-1160 for all your mold remediation needs. Corporate Jet Cleaning, Pensacola, FL. This corporate jet needed its wool carpets and upholstery cleaned. The head of maintenance called SERVPRO of West Pensacola and asked if we could put the planes on a regular schedule. After cleaning the customer was extremely pleased with the results and will now have us come out several times a year to maintain the fleet. Call us and see how we can help you at 850-469-1160. 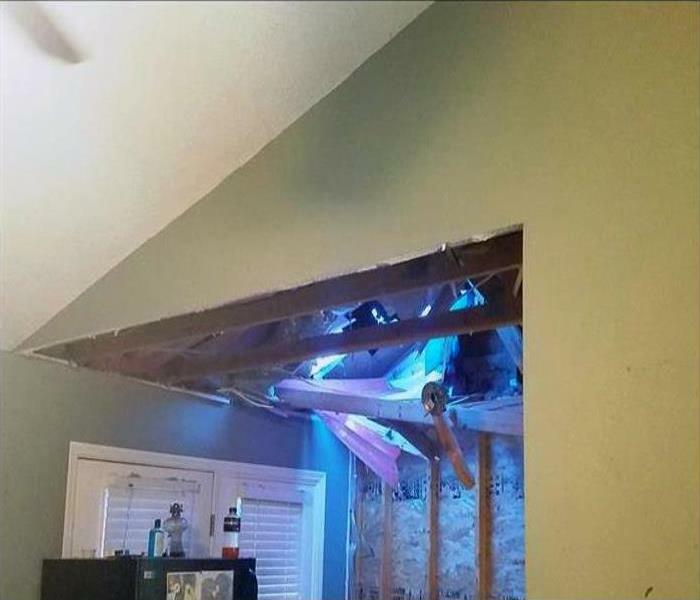 The leak in the ceiling led to its collapse in this Pensacola rental unit. The mold patches grew from the excess moisture. The drywall panels, removed by SERVPRO techs, readied the mold remediation for disinfecting before a rebuild of the ceiling. 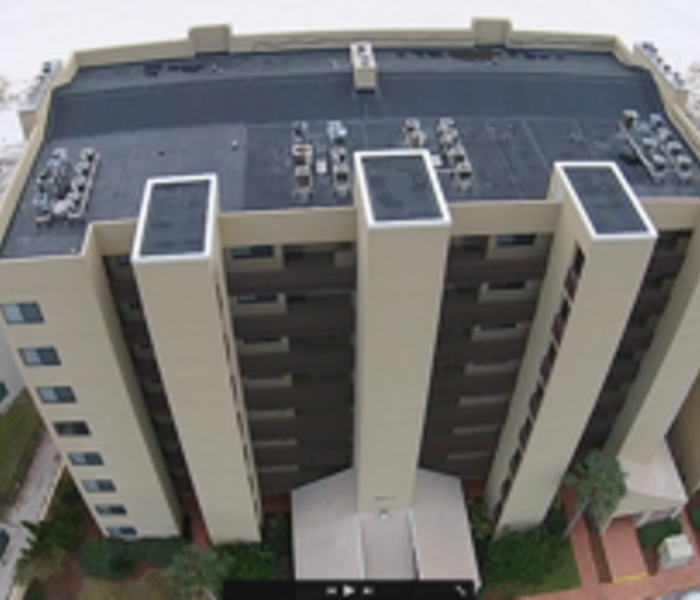 Commercial Cleaning in Downtown Pensacola, FL. During hurricane Irma the Pensacola Bay Center was used by the Red Cross as a temporary shelter for people that had to evacuate south Florida. Once the shelter was no longer needed the Bay Center called SERVPRO of West Pensacola to come and clean and get the center ready for normal business. Call SERVPRO of West Pensacola for all your cleaning needs at 850-469-1160. 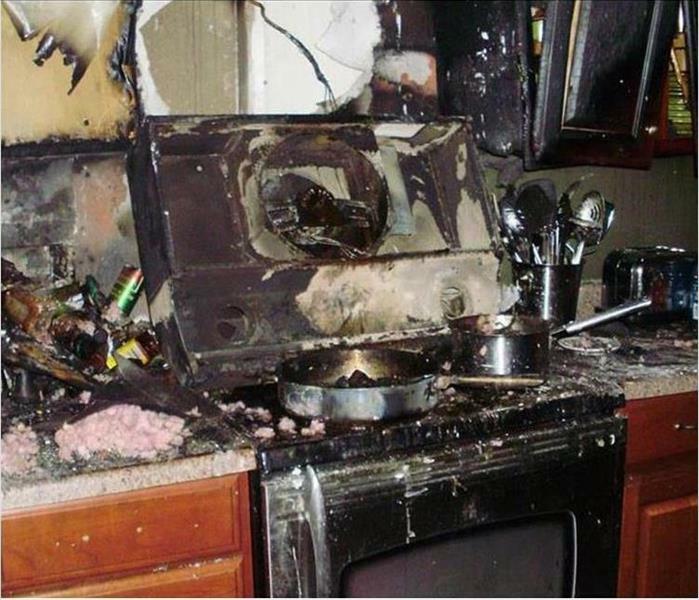 The flames from the cooking on this stove top in Pensacola created quite a mess. The cleanup was going on as we set up hydroxyl generators to improve the indoor air quality. The fire damage was significant, but the smoke circulated throughout the HVAC system and was a large problem. 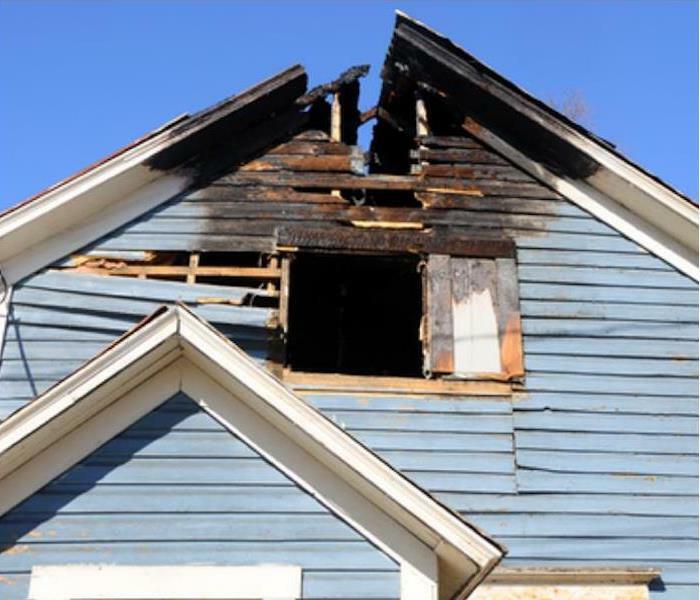 We brought in the right equipment, and eventually restored the home to its preloss condition "Like it never even happened." One of the key responsibilities for the guys at SERVPRO of West Pensacola at any water loss is effectively mapping the water intrusion. We do this by using several tools, including thermal imaging, as seen in this picture. 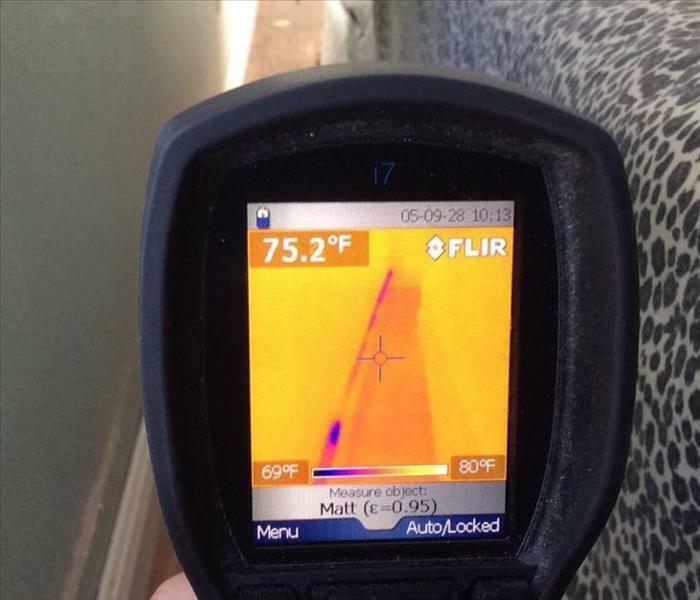 Thermal imaging allows us to see the cooling effect of evaporation behind drywall and other common building materials. This and many other more traditional moisture meters allow us to get a better picture on what's really going on in the hidden spaces of your home or business. Call us at 850-469-1160 and let us help you in the event of a water loss. Mold Remediation in East Hill Pensacola, FL. Proper containment should always be the first step to any Mold remediation job. Even a small job like the one pictured here should start with minimizing cross contamination by setting up containment between affected and non-affected areas. The guys at SERVPRO of West Pensacola alway spend the time to setup the job site properly before any work begins. Call us at 850-469-1160 and let us take care of your next project. Fire damage to this Pensacola home was started by an electrical fire in a second story bedroom. The fire ultimately burnt through the roof causing some structural damage on its way. 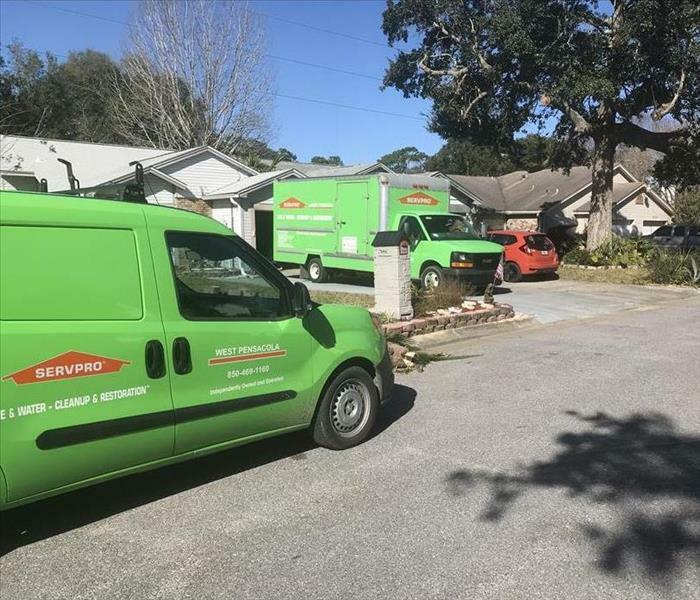 SERVPRO of West Pensacola was contracted to clean up the water damage from firefighting and the reconstruction of the affected part of the structure. Fire at Pensacola State College, in Pensacola FL. This was the aftermath of a small fire that occurred in a men's bathroom at Pensacola State College. Luckily there were no injuries and the damage was limited to a small bathroom which consisted of mostly tile and metal fixtures. 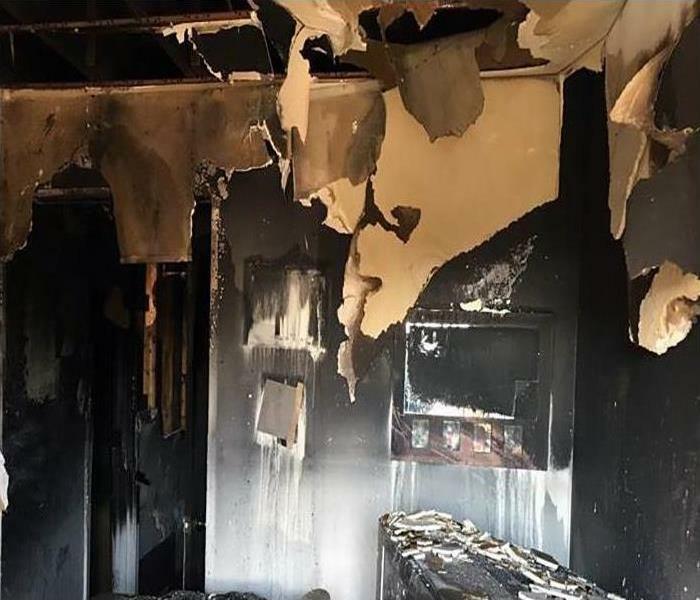 There was significant smoke and soot damage which the guys at SERVPRO of West Pensacola were able to remove quickly using chemical sponges and product designed for soot. The maintenance manager was very please how quickly and completely we were able to clean the bathroom and get the room usable before the students returned to class. Call SERVPRO of West Pensacola for all your smoke and soot disasters at 850-469-1160. Ceiling Collapse in Cantonment FL. This picture was taken shortly after SERVPRO of West Pensacola arrived and cleaned up the ceiling that had collapsed onto the floor of a garage after some heavy spring rains in Cantonment Florida. Our guys removed the damaged drywall and wet insulation and placed drying equipment to dry the rest of the walls. Once dry, new drywall will be installed. Call us for all your emergency water needs at 850-469-1160. Water Damage at a Church in Pensacola, FL. SERVPRO of West Pensacola recently responded to a commercial water damage emergency at a Pensacola church. The team at SERVPRO responded quickly to the call. Our staff used powerful vacuums and pumps to remove the water. 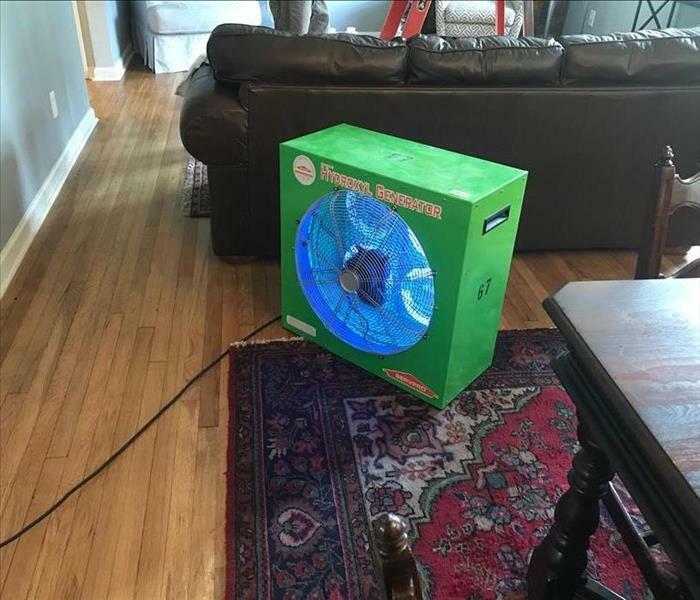 We used relative humidity, room measurements, and temperature to determine the number of dehumidifiers and air movers used in the drying process. The team at SERVPRO of West Pensacola are experts in dealing with commercial damage of any size. Our staff is certified by The Institute of Inspection Cleaning and Restoration Certification in water damage restoration. We provide 24-hour commercial emergency service. At SERVPRO of West Pensacola, we have highly trained technicians that have the knowledge and expertise to handle any size disaster. If your business experiences water damage contact us immediately at (850) 469-1160. 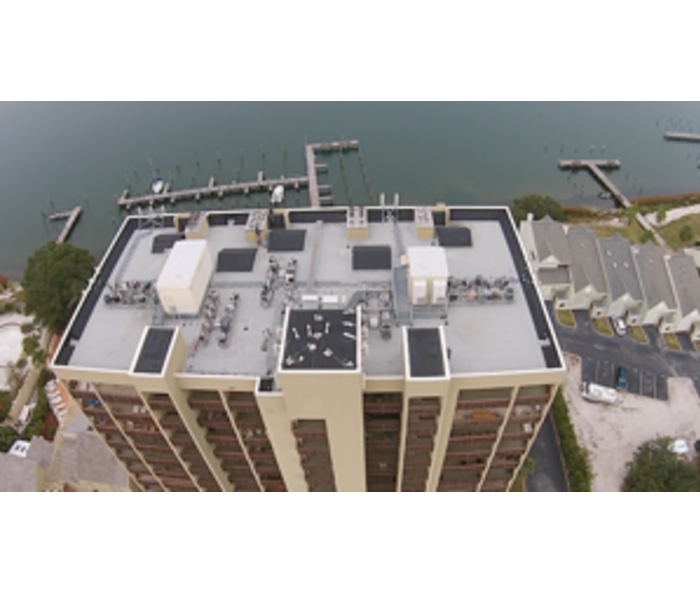 Deodorization of Condo in Pensacola Beach, FL. This is a picture of a hydroxyl generator used by SERVPRO of West Pensacola for deodorization during bio hazard, mold, and fire jobs. Hydroxyls are excellent for the removal of bio odors and can be placed in occupied spaces where people, pets and plants cannot be removed. In this particular job a condo on Pensacola Beach had its refrigerator go out and all the food spoiled. 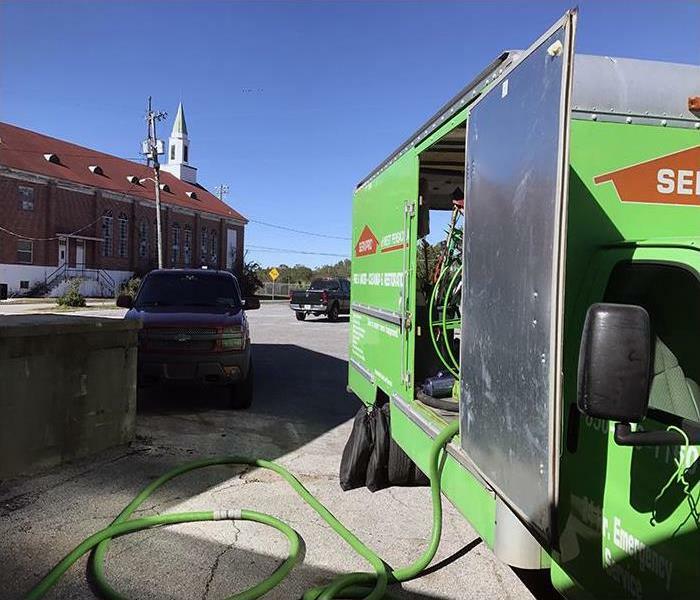 SERVPRO of West Pensacola was able to clean the affected area with a product designed for bio odors, clean the HVAC ducts and coil and then leave the hydroxyl generator for two days eliminating any lingering odors. If you would like to have your house or business deodorized call SERVPRO of West Pensacola at 850-469-1160 today. Bathroom Mold in Pensacola, FL. This picture was taken after mold remediation had been performed in a bathroom in downtown Pensacola. The homeowner's plumber was fixing a leak and noticed microbial growth inside the wall. 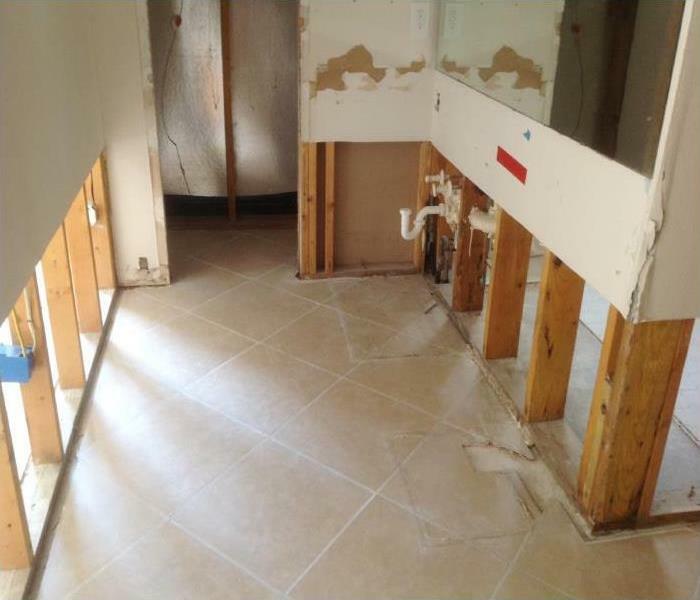 SERVPRO of West Pensacola was contacted and hired to remove the affected materials and treat the area and dry the wall so that the bathroom could be rebuilt safely. 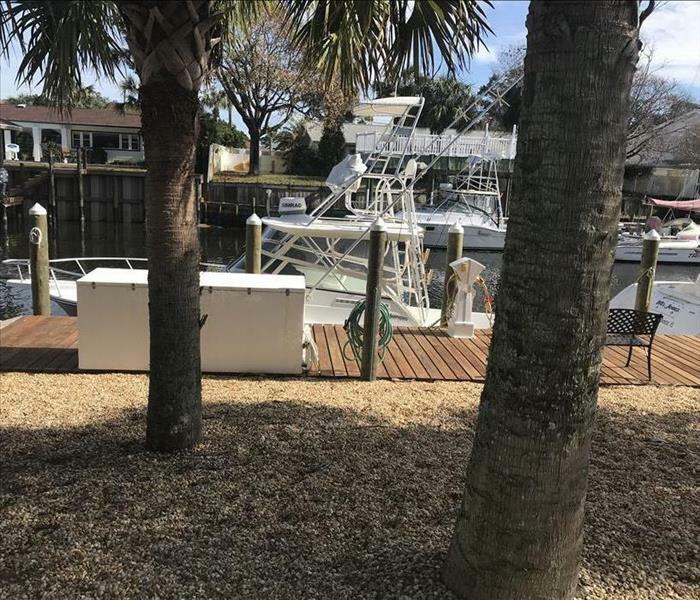 Once everything was treated and dry SERVPRO of West Pensacola technicians coated the affected area with a sealer that reduces the chance of future growth. If you have had a leak call SERVPRO of West Pensacola at 850-469-1160 and let us provide you with a free estimate. Commercial Water Loss in Ensley, FL. This picture was taken on a Sunday morning shortly after an employee noticed water running out of the building. A water fountain feed line had broken and flooded the first and second floor of an office building. SERVPRO of West Pensacola was called out on a Sunday morning to extract water and place drying equipment to stabilize the building. Just another example of being "Faster to Any Size Disaster". Call SERVPRO of West Pensacola for all your emergency needs at 850-469-1160. At SERVPRO of West Pensacola we have to be ready at a moments notice, 24/7. At the end of every day our trucks are restocked with products and equipment awaiting the next call. This picture was taken shortly after arriving on a job site on a Saturday morning in Pensacola Beach. Our truck was fully stocked and had everything we needed. Call SERVPRO of West Pensacola at 850-469-1160 we are ready! This house had a fire which did enough damage to require the drywall and insulation to be removed. SERVPRO of West Pensacola met with the customer and was able to provide the tear out of affected materials. The customer already had a contractor that they wanted to use for the rebuild so our job was to make the house contractor ready. 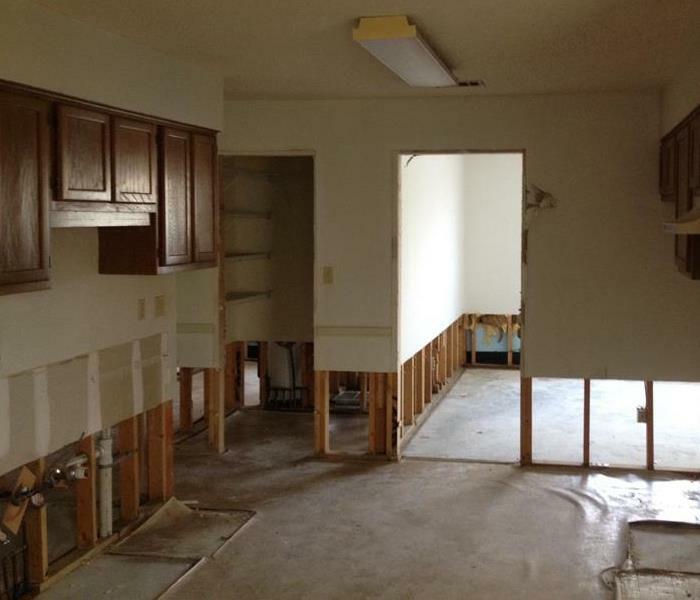 This means removing all affected materials and debris, including nails and screws form the studs, and making the transition from SERVPRO of West Pensacola to contractor go as smoothly as possible. Call SERVPRO of West Pensacola today at 850-469-1160 and let us help you in your time of need. We will work with you and your contractor to make the project go seamlessly. Smoke Damage due to Fire in Brent, FL. This was a fairly new home that had a small fire which created more smoke and water damage than anything else. The owner had carpet throughout which had been saturated with water and smoke residue from the fire. SERVPRO of West Pensacola removed the carpet and pad, dried the structure and treated the structure for smoke odor. Call SERVPRO of West Pensacola for all your needs at 850-469-1160. Mold damage at this Pensacola home spread significantly due to the home being unoccupied. 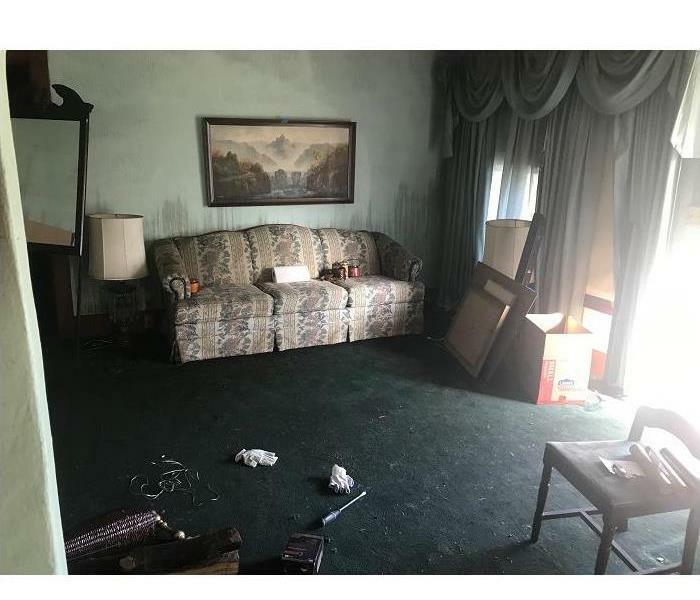 The home was for sale, and there was a considerable amount of time between showings which delayed the discovery of the mold. Mold Remediation Containment in Pensacola Beach, FL. This condo owner called SERVPRO of West Pensacola after a roof leak had caused water and mold damage inside a wall in two rooms. The most important step of any mold job is proper containment of the affected work area. It is our job to remove the affected materials without cross contaminating the unaffected areas of the property. In this picture you can see a barrier was constructed keeping the work area separate from the rest of the house. Negative air scrubbers and proper containment provide a necessary buffer between the affected and unaffected spaces. Call SERVPRO of West Pensacola at 850-469-1160 for a free mold estimate and let us help you with any issues you might be having with your house or business. Kitchen Fire in West Pensacola, FL. This is a sky light in the kitchen of a house in West Pensacola, FL. The home owner had a very small grease fire on the stove and was able to extinguish the fire themselves. 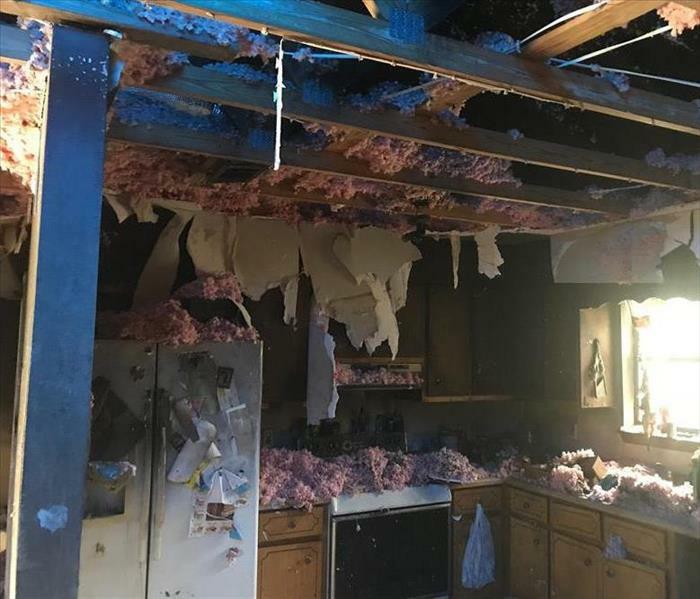 The home owners asked SERVPRO of West Pensacola to give them an estimate on cleaning their kitchen and removing the odor associated with a protein fire. Our technicians were able to show the home owners in person the extent of smoke damage by using a fire sponge on the walls of the sky light. To the naked eye there appeared to be no damage or smoke residue on the walls, but after a quick wipe with the sponge we were able to show the owners the extent of smoke damage and prepare an estimate for its removal. Call SERVPRO of West Pensacola at 850-469-1160 and let us show you how we can remove smoke and smoke odors from your house or property. This condo on Pensacola Beach had a slow toilet feed line leak, and because the condo is unoccupied for long stretches of time, the water leak turned in to a mold problem. Mold was found to be growing in and on the walls and baseboards in several rooms. This picture was taken after appropriate steps were taken to remove the affected materials and properly clean and treat the areas following IICRC guidelines for mold remediation. Once the affected areas had been treated we needed to completely dry the structure, as seen in this picture, before reconstruction could begin. If you have a problem with mold give SERVPRO of West Pensacola a call at 850-469-1160. This photo was taken during a demonstration of an ultrasonic cleaning machine given by Steve Anderson. SERVPRO of West Pensacola in partnership with SERVPRO of Santa Rosa now offers ultrasonic cleaning in Pensacola and the surrounding areas. With Ultrasonics no scrubbing or abrasive chemicals are necessary. Sound waves lift away soot, smoke and odor: This process is much more efficient and effective than any other known means. Call us today to learn more at 850-469-1160. 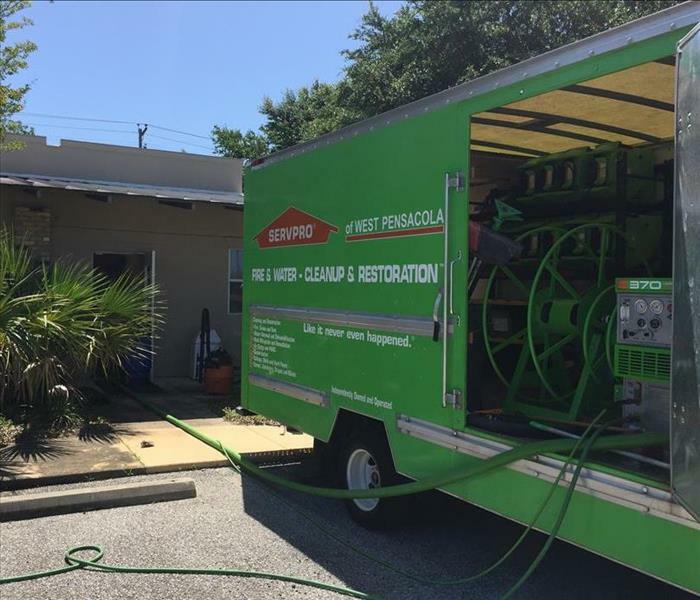 SERVPRO of West Pensacola has experience restoring homes and businesses impacted by flooding and storms. 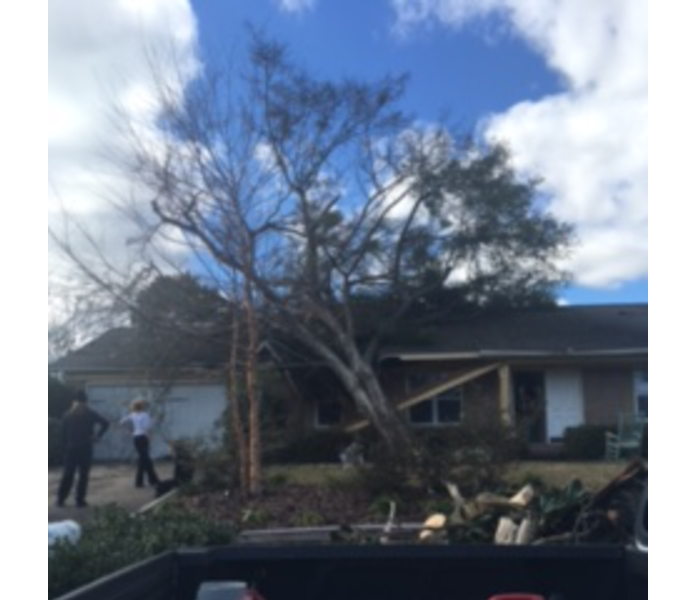 We responded immediately to the recent tornado in Pensacola. The National Weather Service reported a EF-3 Tornado with estimated peak winds of 155 MPH impacted a large area of Pensacola. The tornado left a path of destruction 300 yards wide and 8 miles long. The tornado touched down 1.5 miles northwest of the Pensacola Airport. A quick response is very important to flooding and storm damage, it can greatly reduce secondary damage and restoration costs. Our highly trained technicians employ specialized techniques and equipment to restore your home or business back to pre-storm condition. Call us 24/7 at 850-469-1160. 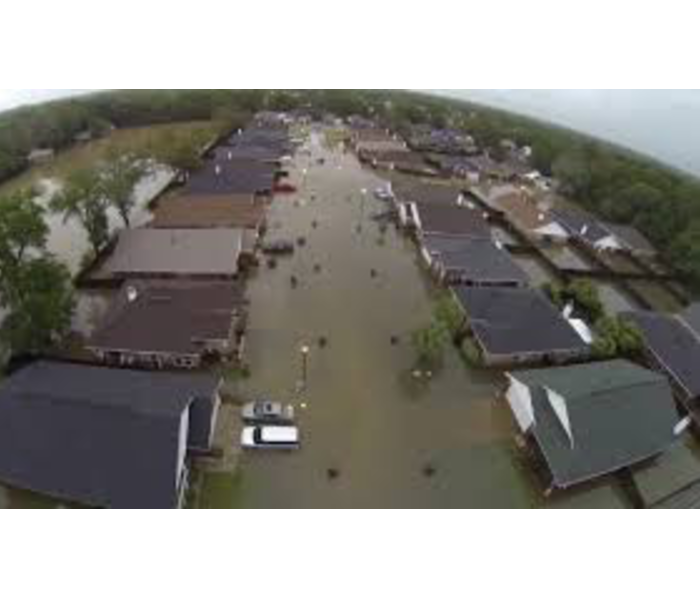 SERVPRO of West Pensacola has experience restoring homes impacted by flooding and storms. We can respond immediately with our local team of highly trained technicians who employ specialized equipment and techniques to restore your home or business back to pre-storm condition. SERVPRO Canopy Photos will provide you with a canopy view of your property. Plus you have a digital record of your property and assets, it can be utilized before, during or after an event. SERVPRO of West Pensacola is a trusted leader in the restoration industry. We provide 24-hour emergency service and are dedicated to responding faster to any size disaster. If your commercial property in the Pensacola, Perdido Key or Warrington area suffers from fire damage or water damage, we're ready to help. Call 850-469-1160 to find out how you can benefit from the Canopy Photo service that we offer to our customers at no charge. Cleaning and restoring commercial properties require a unique blend of experience, equipment and training. SERVPRO of West Pensacola has the expertise and local resources to provide excellent results while minimizing the disruption to your clients. 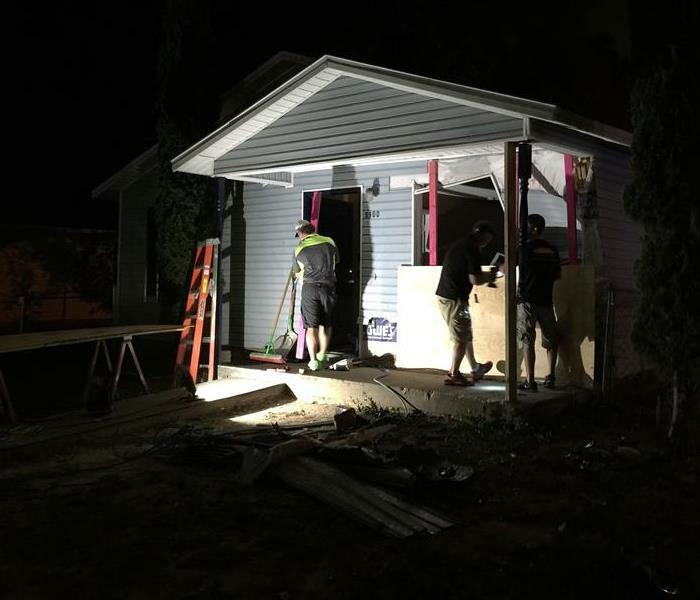 We can help make it “Like it never even happened.” We are available 24 hours a day to restore your Pensacola and Pensocola Beach area property and get you back to business. Call us for help with commercial properties including Hotel/Motels, Large and Small Offices, High-Rise Buildings, Senior Living Communities, Apartments, Restaurants and many more. Flood Damage to the offices of Mercury Machining Company occurred when the main feeder line burst. You can see water stains on the baseboard and drywall. We extracted the water and provided water damage cleanup services. Mercury Machining is a highly respected business and thus very busy. It was important that we complete the project thoroughly and efficiently so they could resume the good work they do for their customers. Don’t let water damage slow your business down. SERVPRO of West Pensacola is available 24/7 at (850) 469-1160 to provide emergency service. A chiller line broke on the roof of the VA clinic in Pensacola off hwy. 98, flooding most of the structure on multiple floors, requiring extensive water extraction and drying by SERVPRO of West Pensacola. 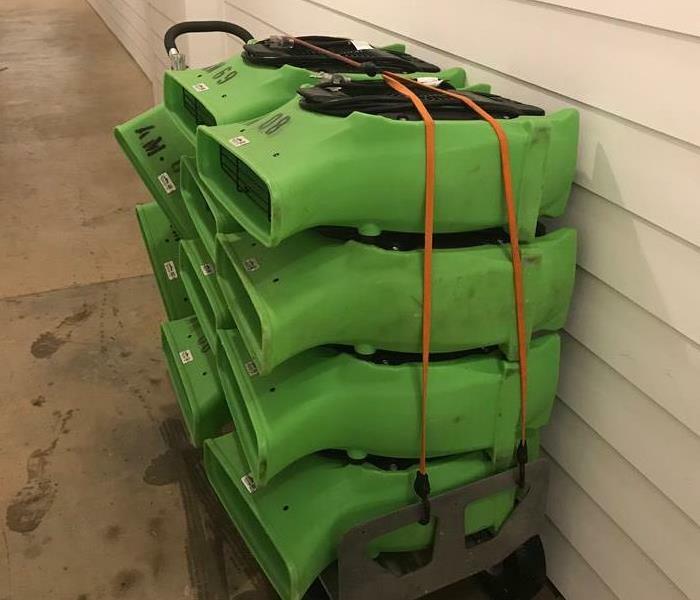 The facility wanted to remain open during the day so SERVPRO had to remove the drying equipment during the day while patients were inside the building and then return after hours to place the equipment for drying at night. This is a picture of the waiting area at night with drying equipment in place. All monitoring, drying, and work was done after hours, out of sight, so as not to disturb the normal day to day operation of the Clinic. This picture was taken at the back entrance to the VA Clinic in Pensacola. The total volume of the structure was so large that it was necessary to dry the structure using a large mobile descant parked outside and then pipe the hot dry air inside using flexible ducting. 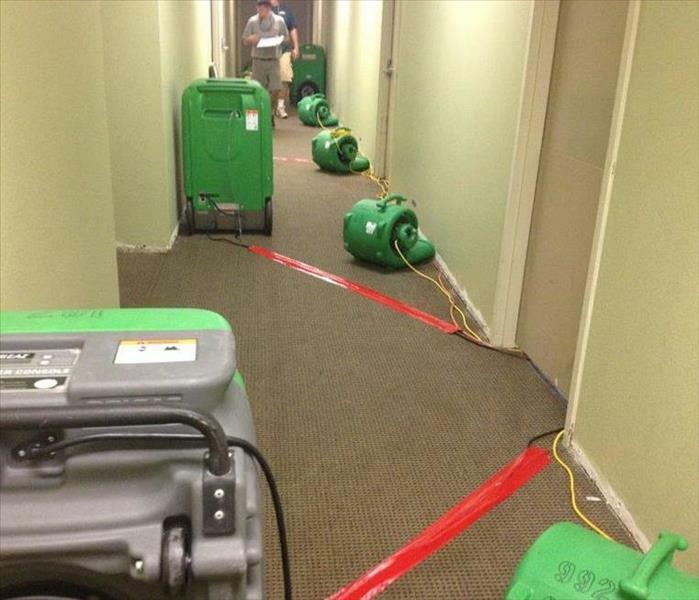 The facility wanted to remain open during the day so SERVPRO had to remove the drying equipment during the day while patients were inside the building and then return after hours to place the equipment for drying at night. All monitoring, drying, and work was done after hours, out of sight, so as not to disturb the normal day to day operation of the Clinic. In 2015 the bachelor barracks at the Pensacola Naval Air Station flooded due to a mechanical failure of a valve. This particular barracks was constructed in the style of a hotel with individual suites and common areas. 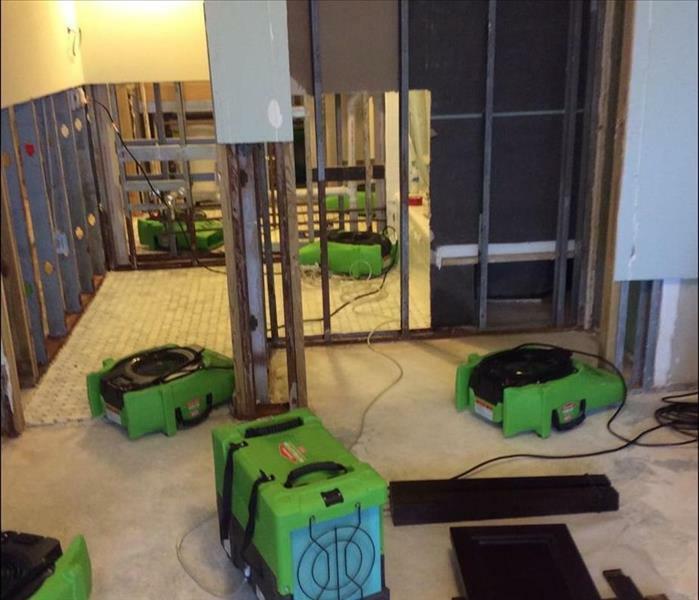 SERVPRO of West Pensacola had to extract the water and place over 300 pieces of drying equipment ensuring that the structure would dry in a timely manner. 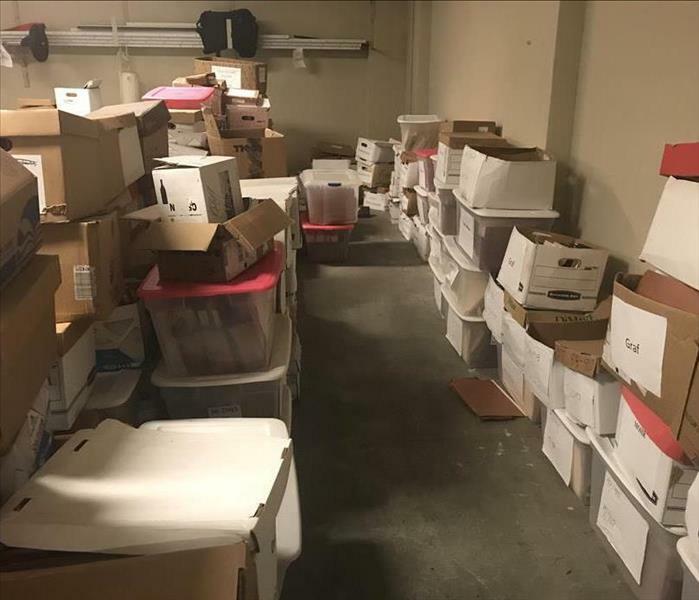 This is a photo of the parking lot just to the west of the barracks where the equipment was staged and being documented by Eva our marketing rep. before being placed inside. This job is a great example of our ability to call on our SERVPRO network and have additional drying equipment brought in from outside our market to help deliver the job in a timely manner. This is a residential loss that was caused by a broken pipe outside the homeowners house. 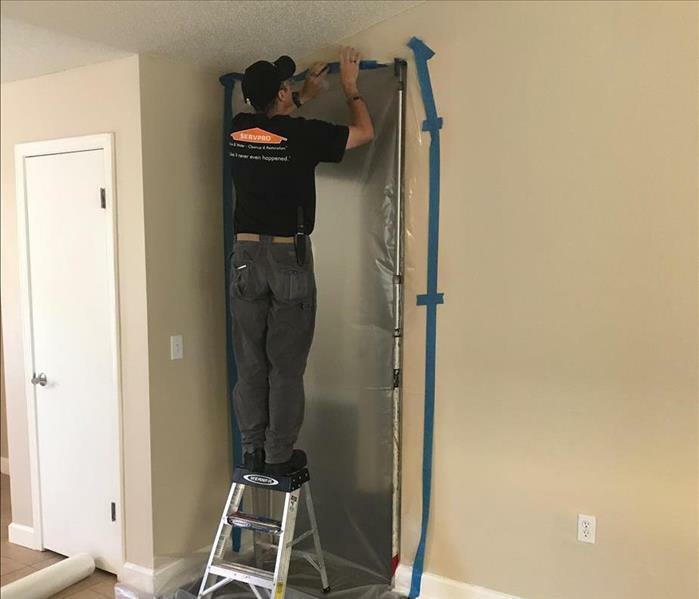 The ECUA called us to help find any trapped or hidden water in the walls of the homeowners bedroom in an effort to prevent any future damage from microbial growth. SERVPRO of West Pensacola ended up placing a dehumidifier and air movers in the bedroom after the FLIR cameral found that the base of the wall had indeed been affected by water intrusion. This was the aftermath of a drunk driver that lost control of her car and drove in to a house that was occupied. SERVPRO of West Pensacola was called by the family of the homeowner to board up the house and provide biohazard cleanup services as a result of blood from injuries. Fortunately, there was no loss of life. In 2014 Pensacola had a historical flood which affected hundreds of homes and businesses in and around the Pensacola area. 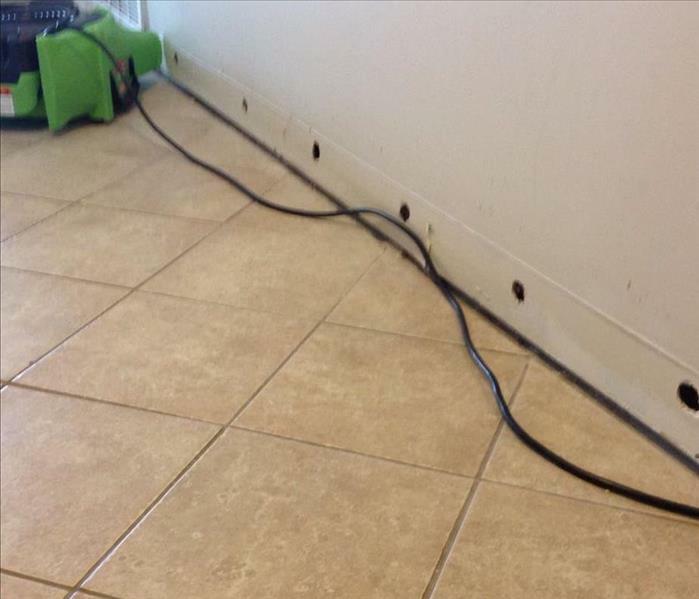 This photo is an example of a typical flood cut performed by our team at SERVPRO of West Pensacola to mitigate the flood damage and prevent any further damage that could be cause by the onset of mold. It is important to make the cut as clean and straight as possible and remove all nails and screws making the reinstall of drywall as easy as possible for the next crew. In 2014 a sprinkler main broke loose in the concourse of the Pensacola Airport sending thousand of gallons of water cascading down to the floor. SERVPRO of West Pensacola was called to extract the water and dry the structure without closing the airport or delaying any flights. 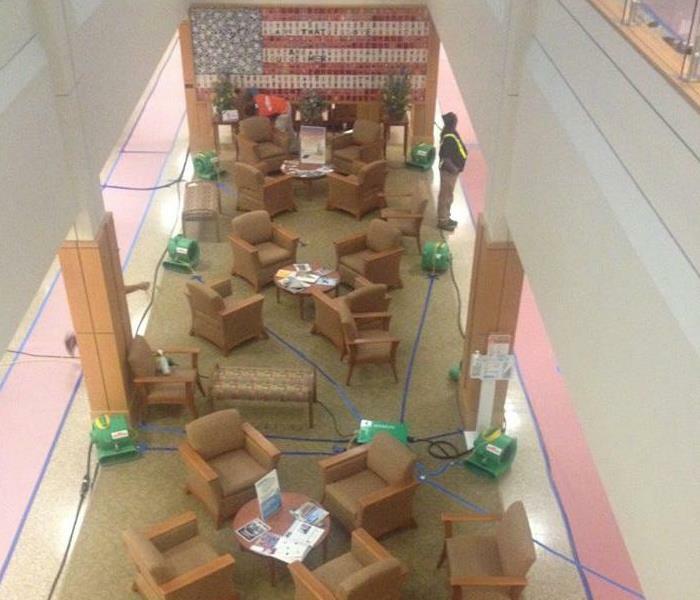 SERVPRO crews worked through the night to make sure the concourse would open in the morning without delay. In 2014 a large retailer's roof gutter failed and caused massive flooding of their retail space. SERVPRO of West Pensacola was there to pump the water out of the retail space and then later, after the storm, dry the structure. 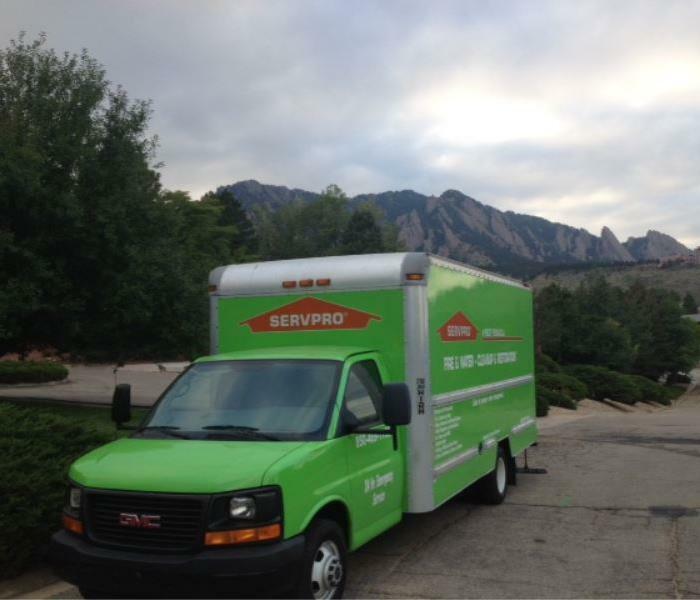 In 2013 SERVPRO of West Pensacola was asked by the SERVPRO franchise of Boulder to help them during a rare flood that affected their service area. SERVPRO of West Pensacola sent a crew and truck on a long journey to help out. This picture was taken outside a customers house whose basement had flooded. We had been so busy that we forgot that we were in the mountains and took this opportunity to snap a picture of our truck with the mountains as a backdrop. Just a great illustration of how SERVPRO franchises are never too far away to help another franchise in need. Call us today at 850-469-1160 and see how we can help you. Hospital water damage in Pensacola, FL. 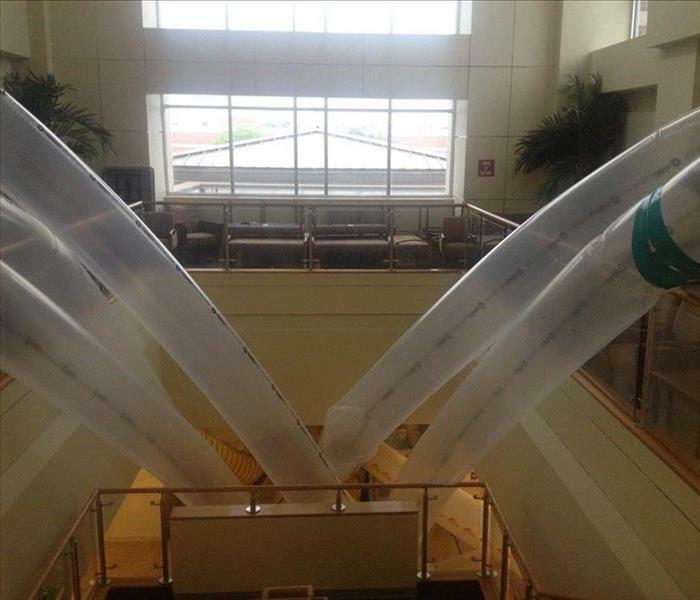 This was a clean water mishap at a Pensacola hospital. This is a back hallway where patients will exit doctors offices and enter the lobby. Because patients and staff use the hallway everyday, its important to tape the electrical cords and place the equipment up against the wall so as not to cause a trip hazard. In this particular case SERVPRO of West Pensacola extracted the water from the floor, treated the carpet and affected drywall with a disinfectant and removed the vinyl base to allow faster drying. The offices were able to open and operate with minimal interruption. 2016 Commercial Duct Cleaning, Pensacola, FL. This picture is the crew setting up for a commercial duct cleaning in Pensacola Florida. This job required the crew at SERVPRO of West Pensacola to work at night after hours so as not to disrupt the customers normal business operation. The job was scheduled over three nights and when completed the customer was extremely happy. Call us at 850-469-1160 and let us provide you with a free quote of all your residential or commercial duct cleaning needs. Visible Mold in Pensacola, FL. This microbial growth was the result of a wet bar sink leaking from the other side of the wall. The Leak was small and slow and took many months before the customer noticed the growth on the other side of the wall. If you suspect mold give SERVPRO of West Pensacola a call at 850-469-1160 and we can schedule a visual inspection and look for signs of activity using our moisture meters and other non evasive methods. If we suspect or see signs of growth we can remediate any problems and provide a plan going forward to prevent future growth. SERVPRO of West Pensacola was called to this house after a small leak went undetected for several weeks behind a wall that had solid wood wainscot. Once the leak was stopped by a plumber we needed to remove a section on wainscot to gain access to the drywall behind. Once it was removed we found a considerable amount of mold growth as seen in the picture. SERVPRO of West Pensacola then proceeded to set up containment and apply the proper techniques to remove the mold and treat the area and dry the structure following proper mold guidelines. 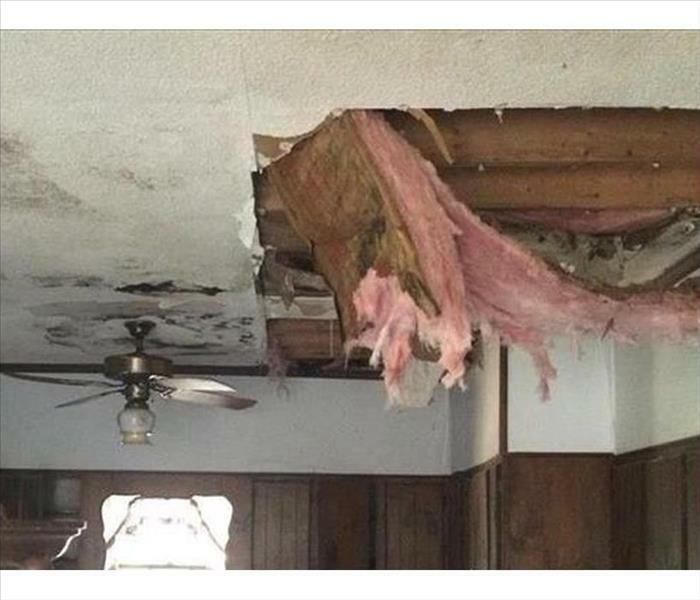 This was a perfect example of what can happen when a water leak goes undetected, Call SERVPRO of West Pensacola at 850-469-1160 for all your water restoration needs. Water Damage Perdido Key, Fl. This vacation home in Perdido Key, Fl. is left vacant several weeks out of the year. During one of these vacant periods the ice maker leaked and saturated the hardwood floors. SERVPRO of West Pensacola was called to extract the water and dry the structure. 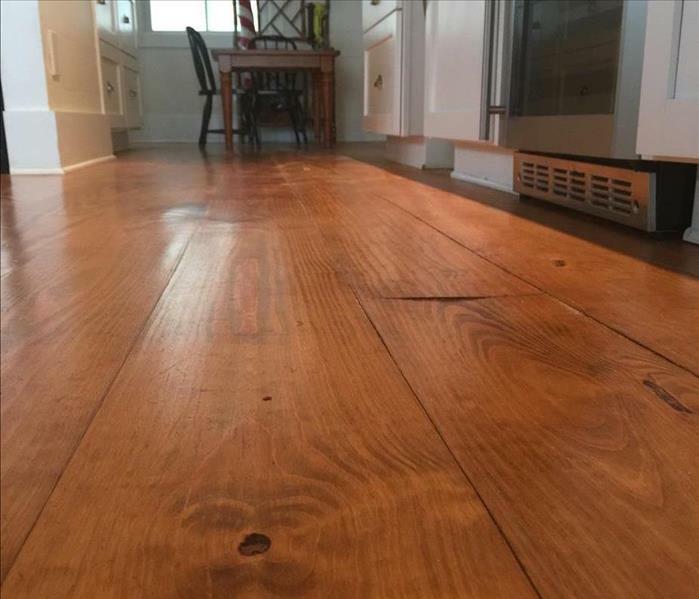 Most newer homes have engineered flooring that doesn't fair very well if it gets wet, but this house had real 3/4 inch tongue and groove hardwood floors. The goal at SERVPRO of West Pensacola is to try and save any and all materials first. In this case, because the floors were real wood, we were able to dry and save 100% of the flooring making the home owner extremely happy. Call SERVPRO of West Pensacola at 850-469-1160 and let our trained professionals help you. This was the aftermath of a washing machine with a stuck float switch. The washing machine overflowed and didn't shut off until the home owner noticed water coming down the hallway. The owner called SERVPRO of West Pensacola to extract and dry the structure. This picture illustrates how our crews, if possible, will take a less evasive approach to drying wall cavities. Instead of removing the drywall or making a flood cut like some restoration companies, our crew decided that they could dry the walls by simply removing the baseboards and drilling small holes every 12 inches allowing air to circulate in the wall cavity. Once drying is complete the holes are covered and new baseboards are placed over where the holes where, making it completely invisible. Call SERVPRO of West Pensacola at 850-469-1160 for all your water emergency needs. This is one of our tucks with a large water extraction unit mounted inside, its capable of extracting massive amounts of water very quickly. Our trucks are desiged for carpet, upholstery, tile and grout, water damage restoration, and fire damage cleanup. Everything we need for any particular job is always close at hand. In this particular case we were doing a large commercial carpet cleaning for an office building that is being cleaned before the new tennant moves in. 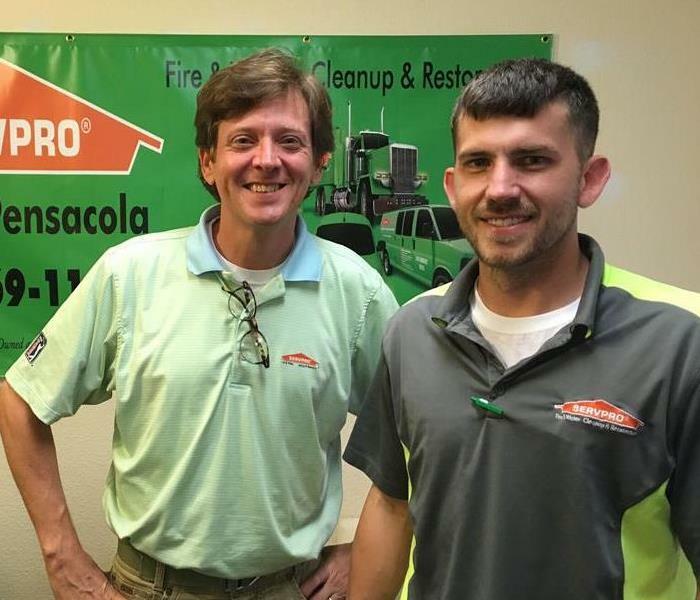 Whatever the job SERVPRO of West Pensacola has you covered. Call us at 850-469-1160 and let us make it "Like it never even happened." This picture was taken about two hours after our team arrived on the scene. There was significat water damage when we arrived, all coming from a broken fire sprinkler head. Once the water was shut off our crews were able to extract the water, remove baseboards and drill holes to allow air to circulate behind the walls. The area was treated with an anti-microbial product to prevent microbial growth and drying equipment was placed. This structure located in Ferry Pass Florida had a two hour turn around from the moment we got the call to the moment equipment was placed. The faster you can get the water up and out the sooner the structure will dry. Call SERVPRO of West Pensacola today at 850-469-1160 and let us help next time you have a water emergency. Flood Damage in Pensacola Beach, FL. Commercial Duct Cleaning in New Warrington, FL. This photo was taken at the start of a very long weekend. 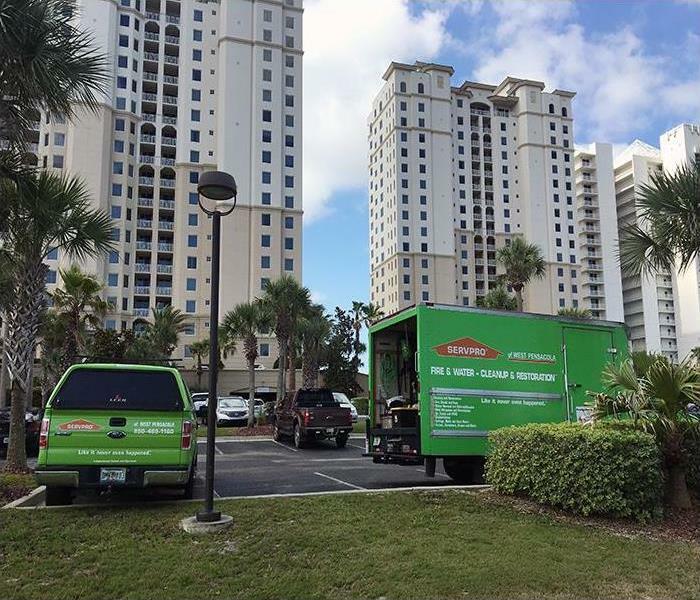 The building manager called SERVPRO of West Pensacola on a Saturday morning with an urgent request for services due to a sewage loss in an apartment complex in Ferry Pass Florida. Our crews were able to extract the water, remove all contaminated materials and clean all the surfaces in no time. Later that night we were called back for another leak from a bathtub that was leaking, and totally unrelated to the original sewage loss. Just another example of our crews diligence and dedication even after hours and on a weekend. Call SERVPRO of West Pensacola anytime you need us at 850-469-1160.